Tutorials, projects, dissertations and more.. 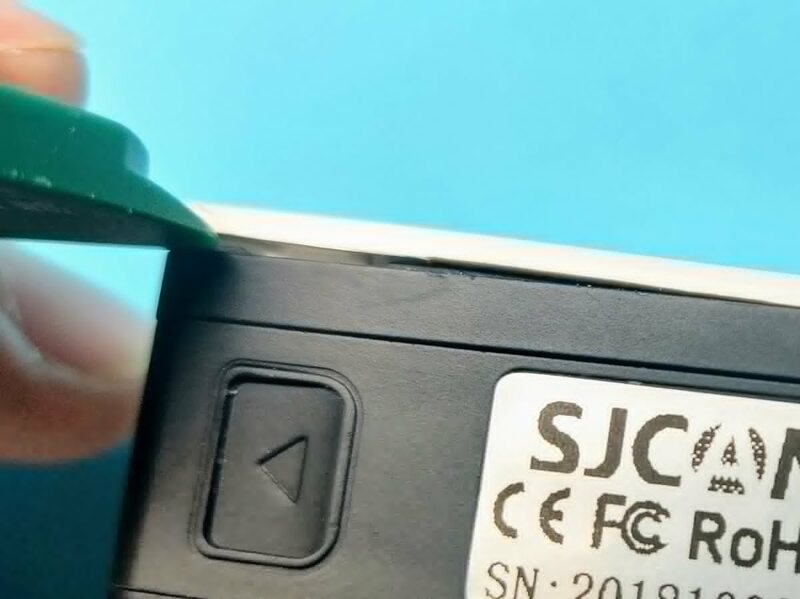 I ordered a SJ8 action cam from a reseller and got one with a broken battery connector. Since shipping it back to China and waiting for a replacement costs time, money and nerfs I did it myself. 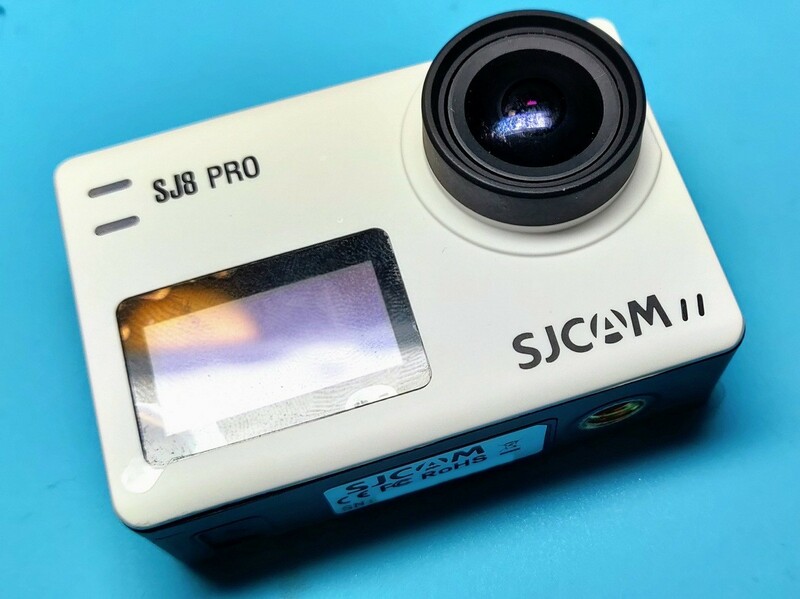 There is not a lot of repair guides on the internet for SJCAM action cameras and I didn’t find any of the latest model, the SJ8. The following will show how I opened it. 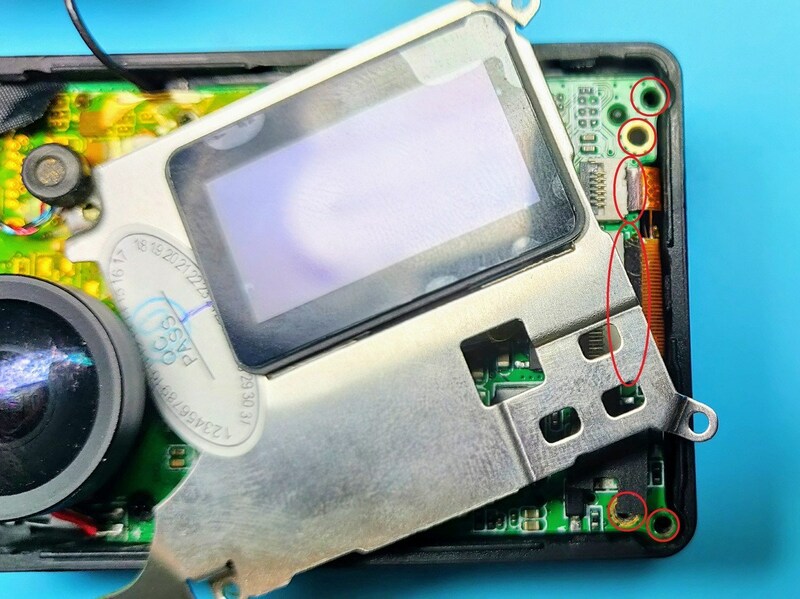 The following screws and connectors need to be removed to open the case - highlighted in red. The green circles are for the lens and can stay attached. The display is attached to the board and does not need to be removed. 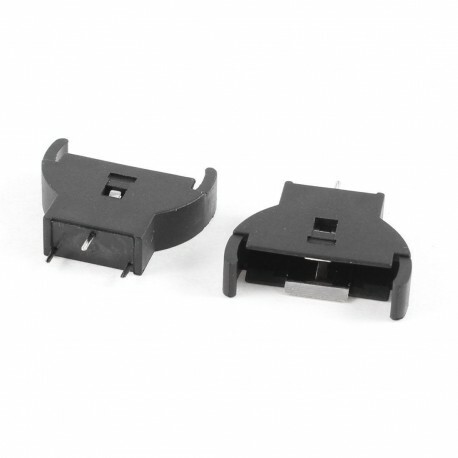 There are two types of connectors on the front. The small one on the bottom will release by opening the black clamp on the right side (under the tape). The connectors on the right side are opening by pulling the black clamp on the left side up. 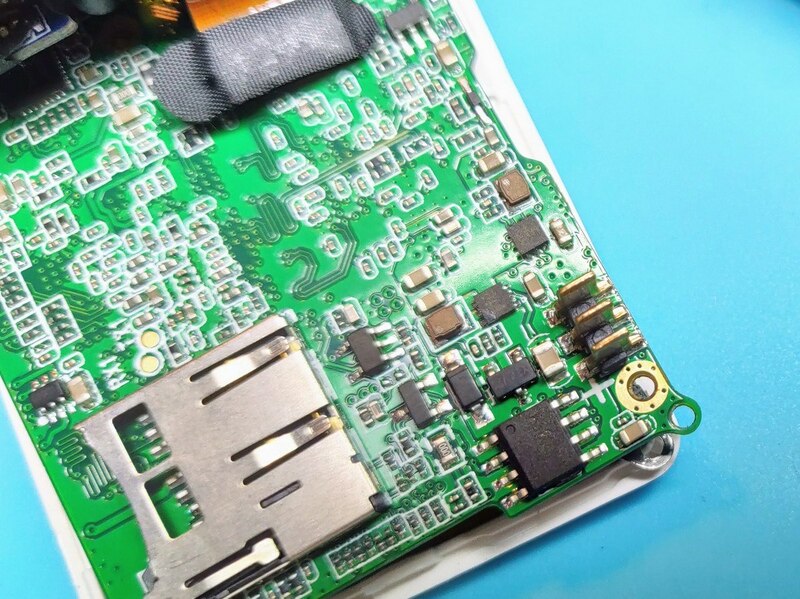 After removing all marked screws and connectors you can remove the board. The backside is closed the same way as the front and can be opened as soon as you have removed the connectors on the front side. 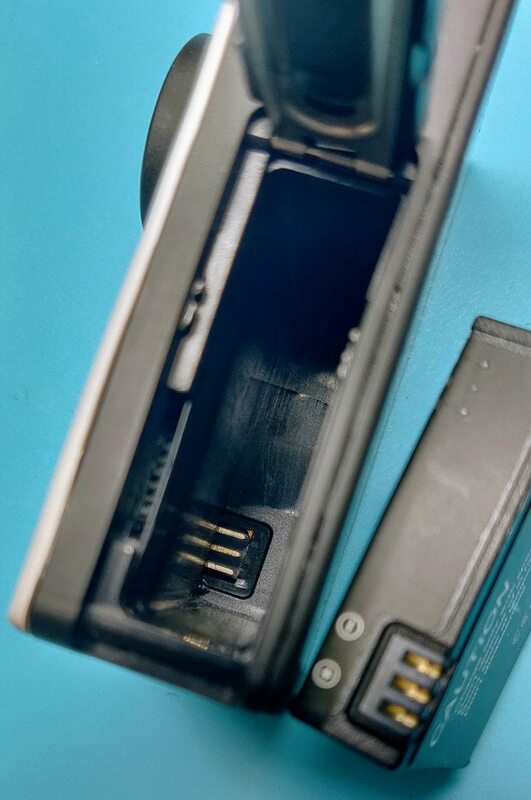 The following two pictures will show the broken battery connector and the reattached one. I used a tiny bit of instant glue to fixate the part at its location. I then melted the existing soldering tin and added some additional. Finally, I tested the connections with a multimeter and added some more instant glue. 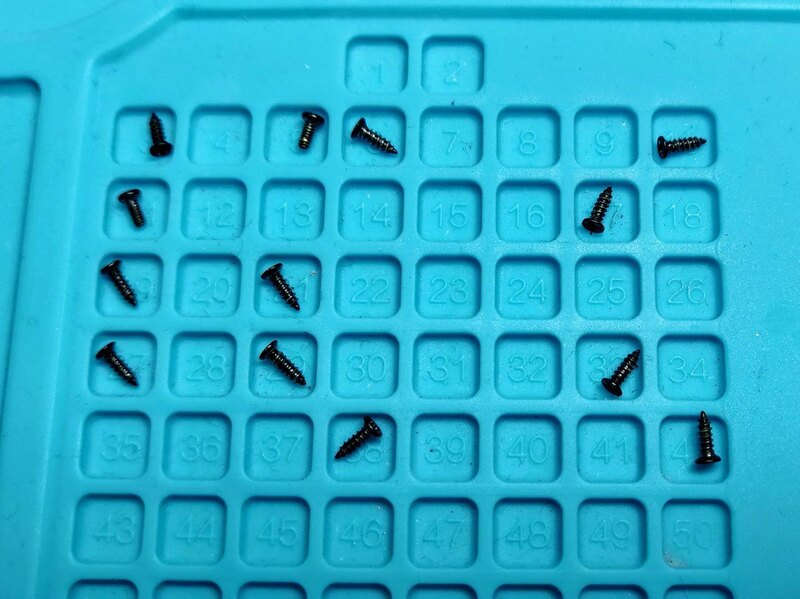 Make sure you accounted for all screws. 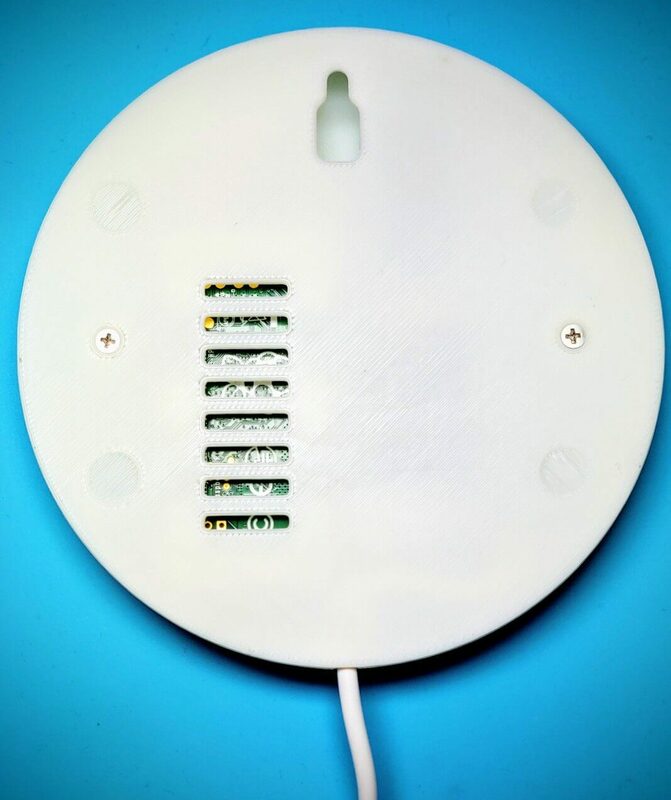 I am using a Zigbee to MQTT bridge for my home automation. 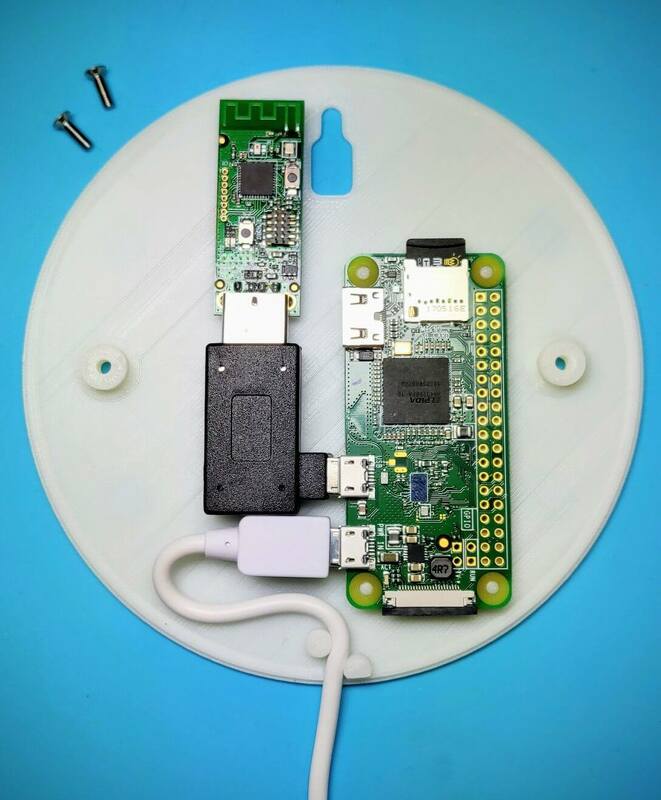 The software runs on a Raspberry Pi Zero W and uses the CC2531 USB Sniffer to talk with Zigbee devices. 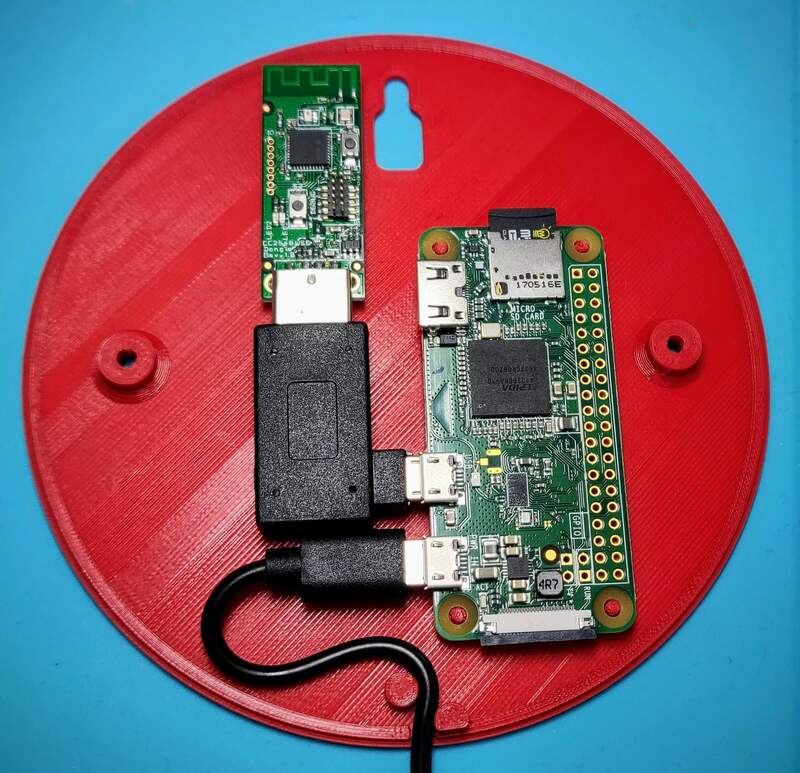 I use a 90 degree angeled USB adapter to connect the USB stick with the Raspberry Pi. The setup of the bridge is described in the zigbee2mqtt getting started guide. I really like the setup but in order to connect with all my devices the bridge needs to be in a central place. At the moment of writing I couldn’t find any case that would support the Raspberry Pi Zero together with the CC2531 USB stick that looks elegant enough to put it into the living room. That is why I created my own case. 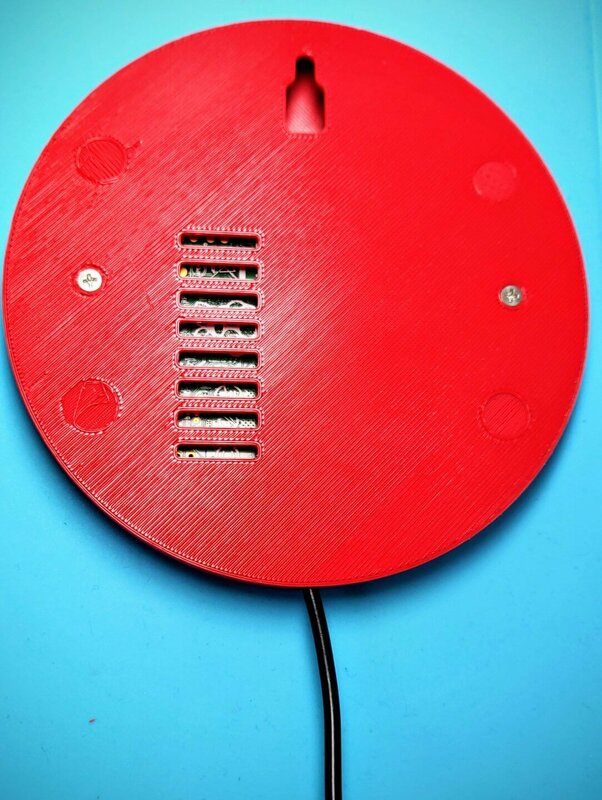 I got my inspiration from a round Raspberry Pi case on Thingiverse. 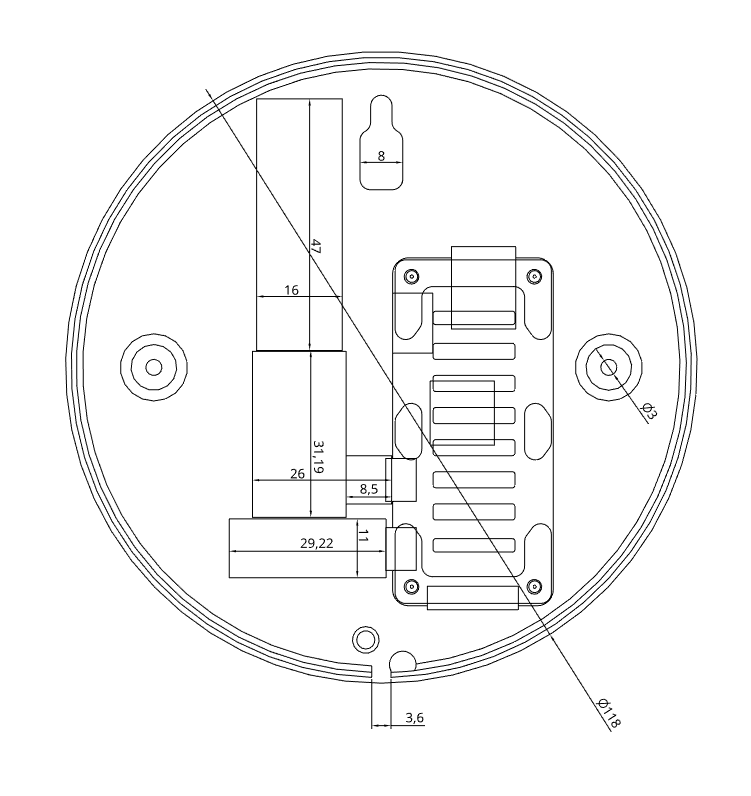 My case design is publicly available in Onshape 1. 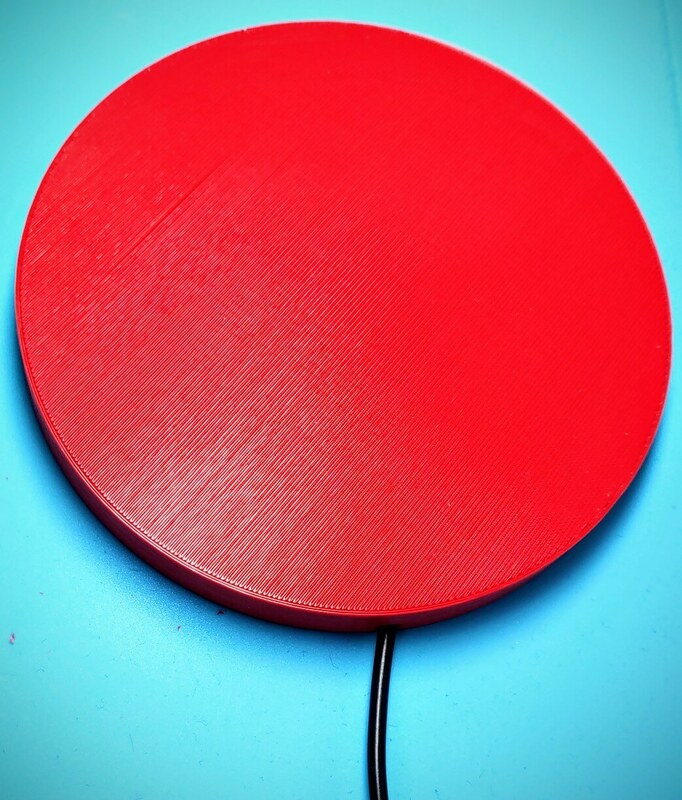 I also posted my case design on Thingiverse 2 since this is the first place to look for 3D files. The STL files can also be downloaded directly from my homepage 3 4 5. Case design at the moment of writing. I started to print the case prototypes in PLA filament since it is easy to print and biodegradable. To close the case I added two M2.5 x 8mm flat head screws and two M2.5 x 4mm embedded knurled nuts. To fix the nuts I used a soldering iron to heat up the nuts and press them into the plastic. The case is 1.5cm high and is close to 12 cm in diameter. The final product I printed in white ABS since I like to have a better head resistant and a stronger material. I changed the ventilation shaft slightly since I didn’t want to use support material. I am not 100% satisfied with the current design. One minor point is that the ventilation doesn’t look to good since i didn’t use support and didn’t post processed it. A slightly more annoying point is that the case has warped a little and the top is not completely closed around the ventilation shaft. 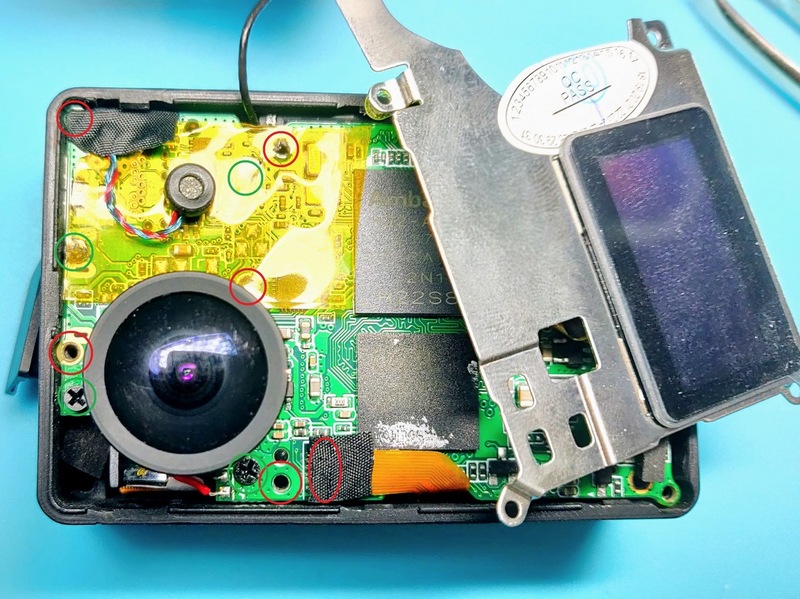 I might need to add some sliding lock functionallity similar to the picture from adafruit in the future. But both points are only visible if you look closely. Mounted to a wall these minor defects are not visible. My biggest concern is regarding the filament. As you can see on the last picture it is slightly transparent. I could make the walls thicker, but I really don’t like to since they are already strong enough. 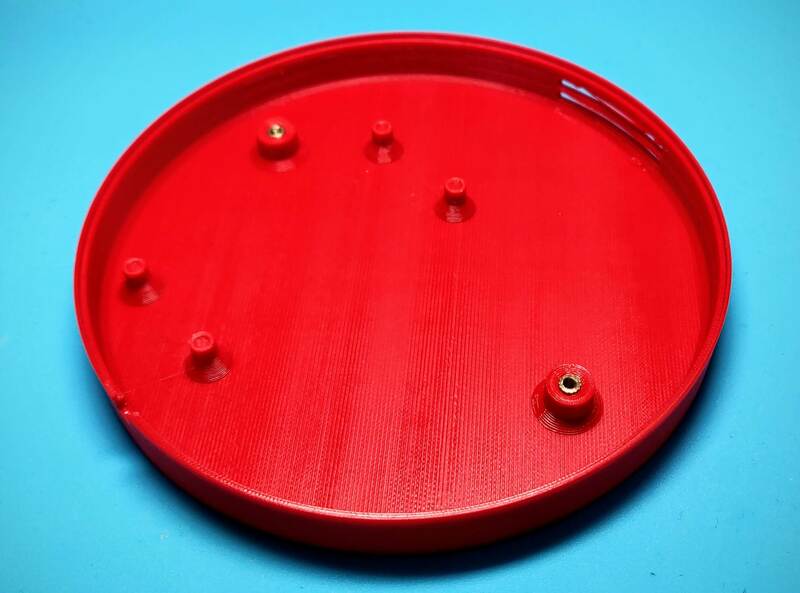 Maybe I will experiment with different filament or color painting the case from the inside. Not sure yet! Lately I get a lot of small packages with hardware modules from China. They take between 2 and 6 weeks to arrive. Some of the parts I’m waiting for are needed to continue my current project(s). 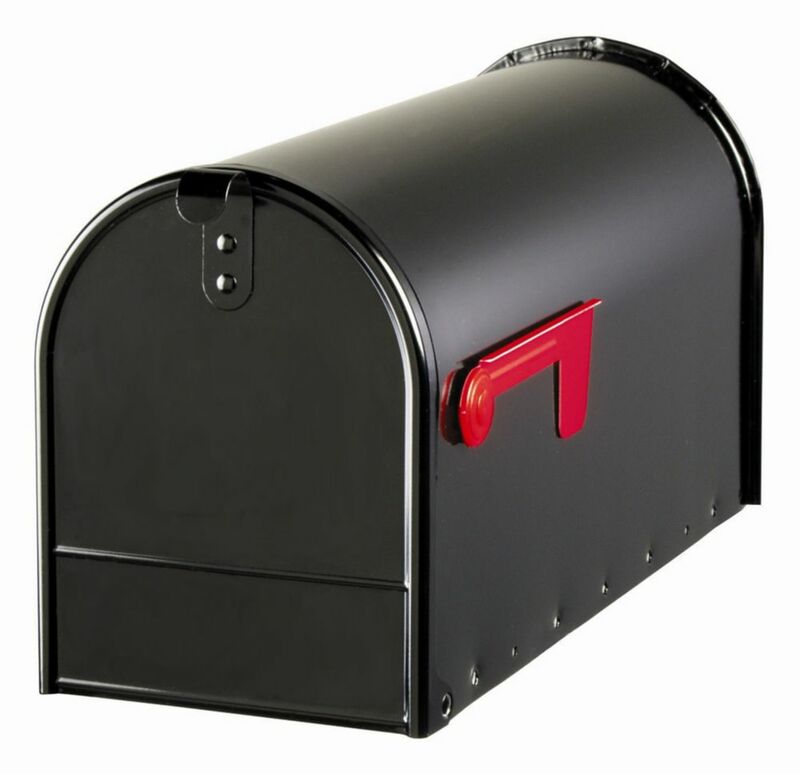 Because of this I often check the mailbox and it is really annoying to open an empty mailbox. Therefore, I was building the mailbox notification. I checked the WIFI inside the mailbox and it was not existing so I couldn’t just use a simple ESP8266 like the Wemos D1 Mini and a battery to get it to work. 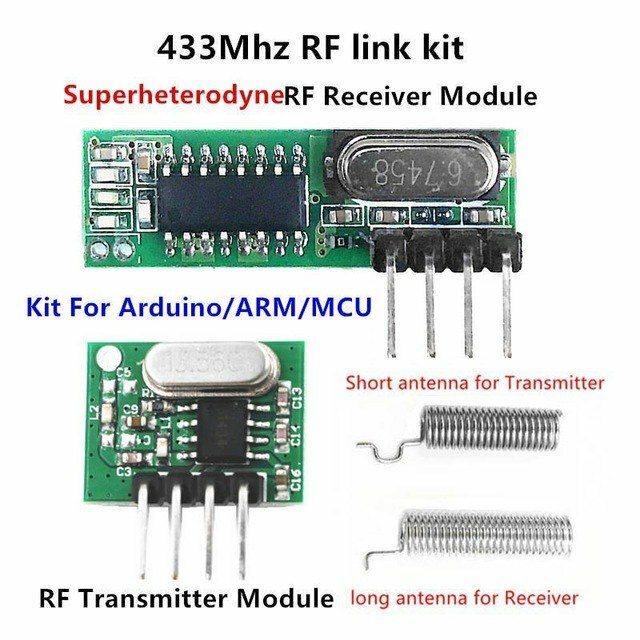 Instead I decided to order a 433 MHz radio frequency (RF) transmitter module and combine it with a very low power ATtiny85 that I can program with Arduino. First, we need to flash a new firmware onto the ATtiny85 since the stock firmware is outdated and - more importantly - waits 5 secs before booting to allow an easy program code upload. For me it was important to get rid of the 5 sec bootup since my solution cuts the power of the ATtiny85 completely as long as the postbox lit is not open. The few seconds it is open will be enough to bootup and send a notification! 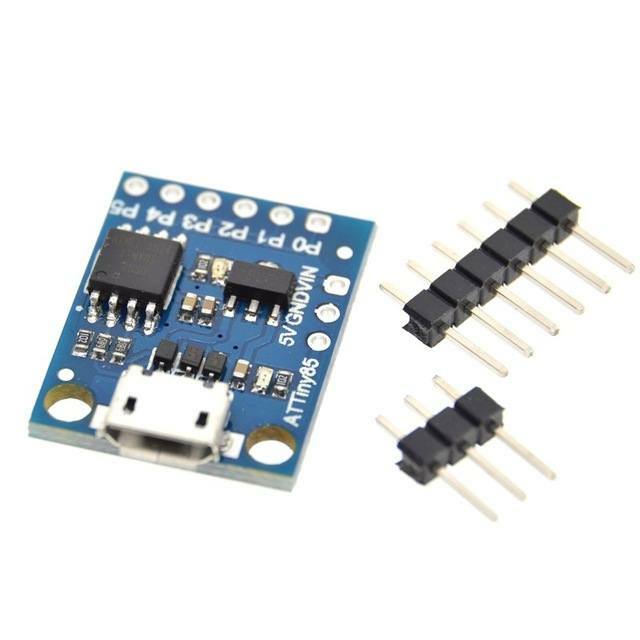 Change the firmware configuration for the ATtiny85 by defining the ENTRYMODE to ENTRY_EXT_RESET. This prevents the 5 sec waiting time on startup. You can reset the ATtiny85 by connecting P5 and GND with a 100R resistor. 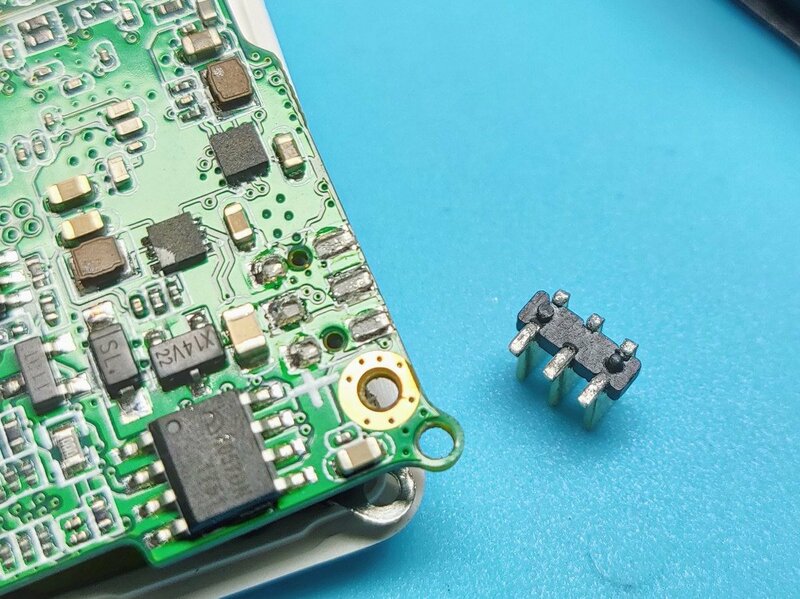 Create upgrade firmware - the ATtiny85 has not enough space for a complete firmware update so you need to generate a firmware upgrade instead of replacing the whole thing. 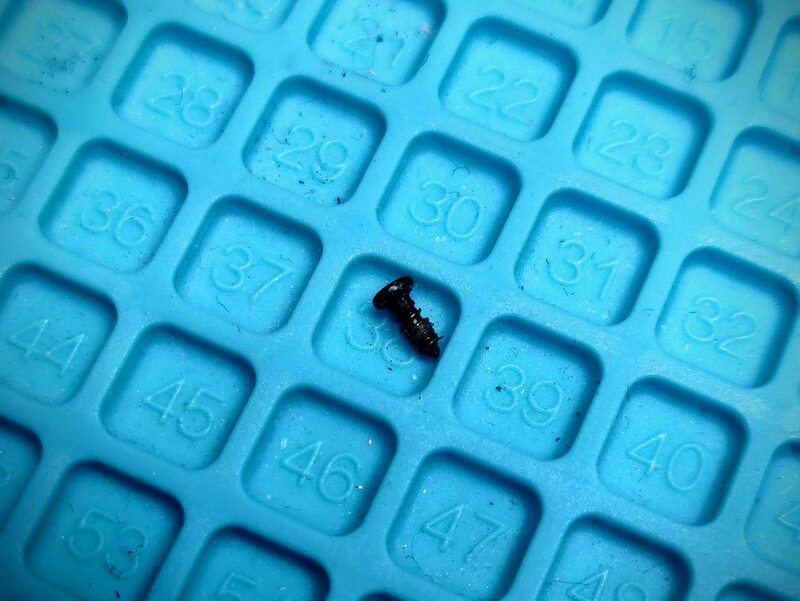 The code I flashed on my ATtiny85 is very small. 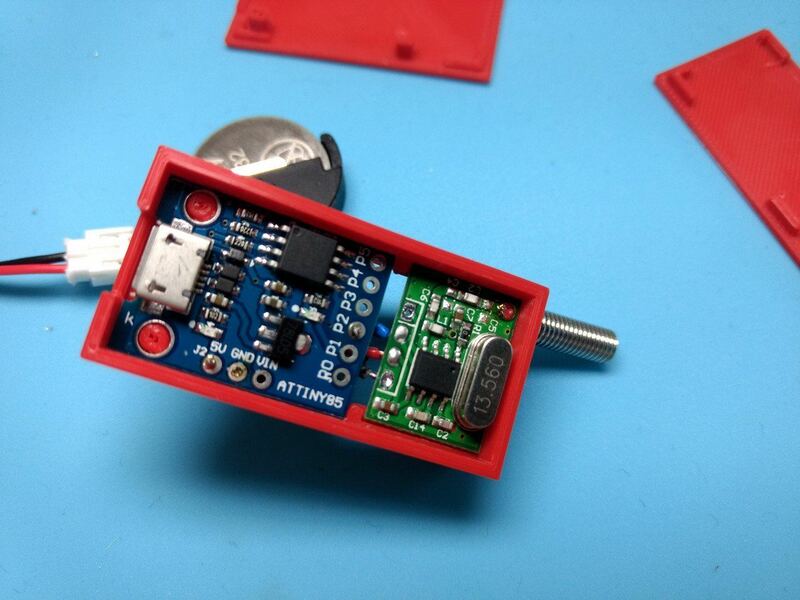 As soon as the ATtiny85 starts it will send the notification 15 times - to make sure it gets received - and then the ATtiny85 goes to sleep in case the postbox stays open and the power is not cut off. The ATtiny85 does not support the serial monitor. You can use the onboard LED to check if your code is running. There is a serial monitor software implementation you could flash but it will take up most of the available space on the ATtiny85. I tried it, but the driver had a bug that repeatedly crashed my Windows PC! 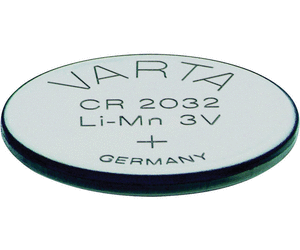 I use a CR2032 button battery to power the ATtiny85. 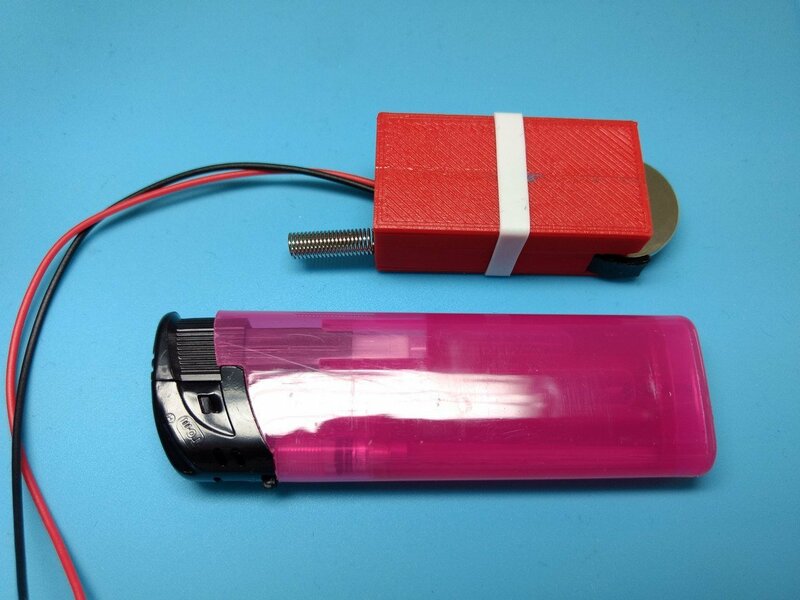 This battery outputs only 3V and the ATtiny85 is used to 5V. To get him to work with a 3V battery we need to downgrade the CPU speed by using the Digispark (1mhz - No USB) profile in the Arduino IDE. The No USB option only means that you can’t reach the USB port inside your code - using the USB port to flash a code update or use the default Digispark (Default - 16.5mhz) profile is not a problem. The following code I used to test the transmitter. I connected the receiver (included in the hardware parts) to a Wemos D1 Mini. It has a ESP8266 WIFI microchip and support the serial monitor. This way you can monitor what you receive. You will also receive signals from other devices since 433 MHz is a common frequency for garage doors. 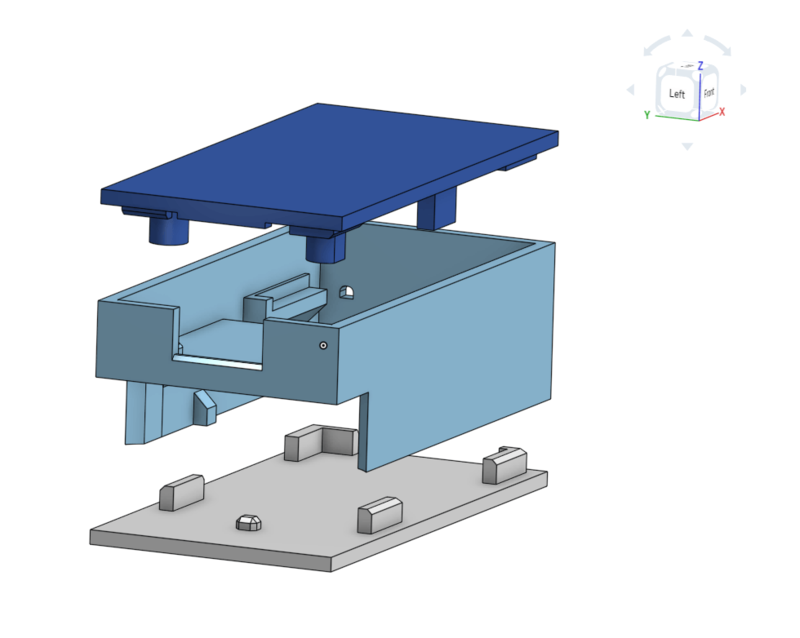 I created a custom 3D case model with Onshape, a CAD online service to get the smallest possible containment for the hardware. I have attached the STL files for you to download in the footer 1 2 3 but I recommend to export the latest version from Onshape directly. Connecting the two wires that go out of the case will boot the ATtiny85 and transmit the notification. The Installation is depending on your postbox. I have a type A postbox. 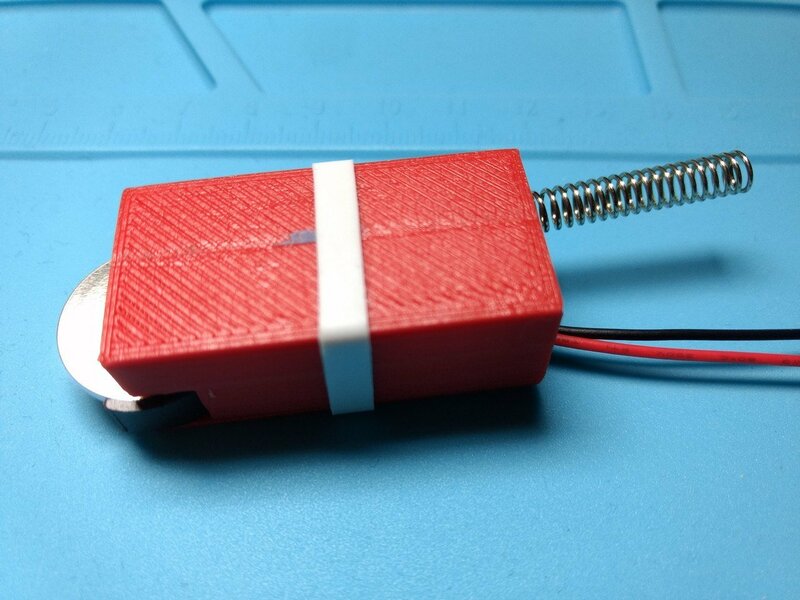 Therefor I have soldered a reed switch (normally closed - NC) to the wires. 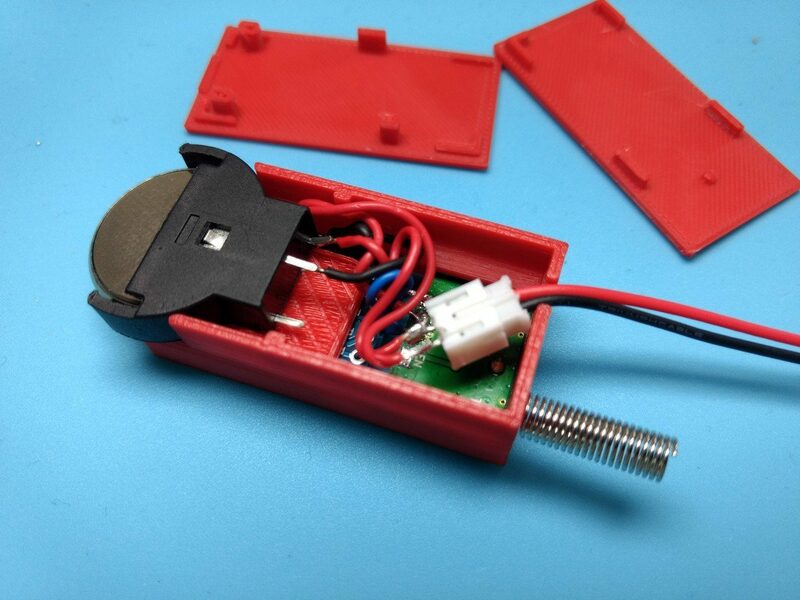 I mounted a magnet on the inside of the postbox lid and the reed switch next to it. 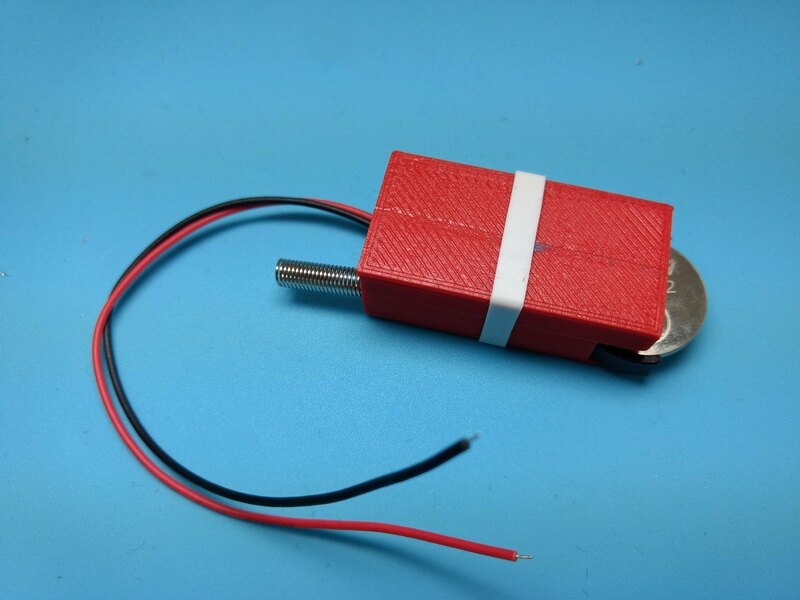 As long as the lid is closed the magnet will be next to the reed switch and there is no connection. 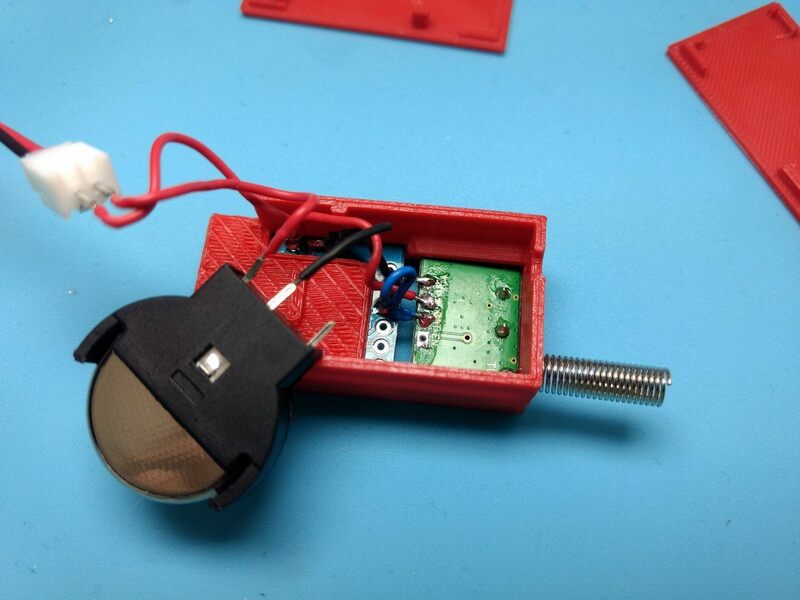 As soon as someone opens the lid the magnet will move away from the reed switch and the ATtiny85 gets powered up. 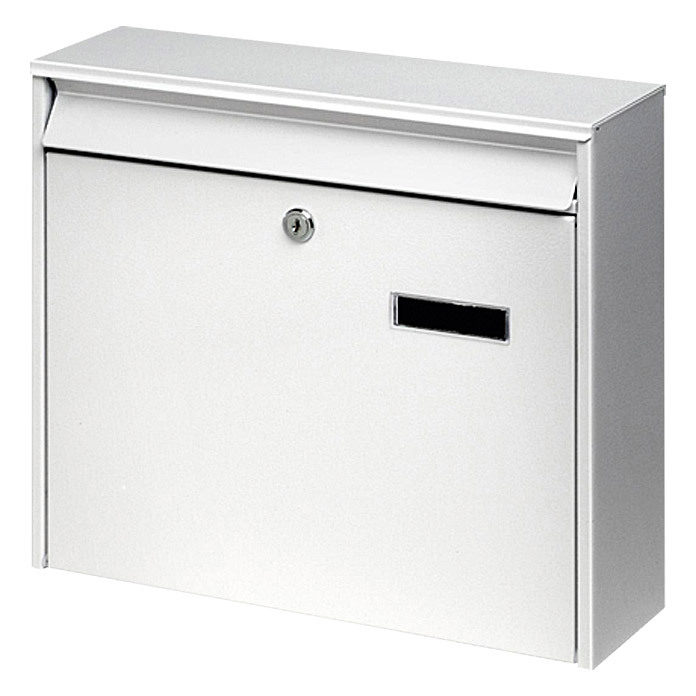 If you have a type B postbox you could use a normally closed switch that is often used in wardrobes. 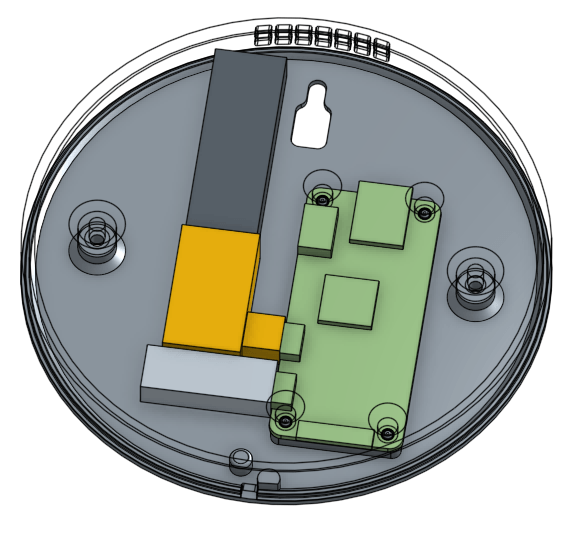 Mount it next to the lid and the ATtiny85 will power up as soon as the lid is open. To receive the notification, I use a Wemos D1 Mini with the receiver attached. The Wemos is running the OpenMQTTGateway software that sends the received 433MHz signal via the MQTT protocol to my Home Assistant software that is running on my server. And finally I have configured Home Assistant to use Pushbullet to notify me on my phone. What is Starcounter and shall I try it? In the past year my team and I used Starcounter as our database and web server for various projects. This writeup will offer you a glimpse of what Starcounter is, what features it offers and which scenario it is best suited for. Starcounter is an in-memory database and web server. To develop on Starcounter you will need to write the backend in C#. For the frontend you can choose to expose a REST API or use their HTML mapping. Starcounter features an app concept that lets you run multiple apps on the same instance - think about the Android or iOS platform. Each app runs in isolation, with its own database. You can share parts of your database with other apps or create integration triggers that will display your app inside other apps. These come in handy if you build single purpose apps. You can for instance build an image gallery app that automatically shows up if another app likes to display images. Starcounter has a good integration in Visual Studio and focuses on development productivity. Their team focuses heavily on eliminating boilerplate from the development process so that the time to market (TTM) of your product reduces. The platform itself has very low hardware requirements compared to other database systems. You can use a NUC in production (if you put enough RAM into it) without compromising the speed of your system. There are a lot more features that Starcounter offers. If you decide to give it a try or like to read more about them, head over to their developer website. As already mentioned the hardware requirements are low and the focus on development productivity by their team helps you build apps fast. Retail systems profit a lot by the speed that an in-memory database offers. Retail systems also have a lot of concurrent transactions that this database handles very well. Therefor it is not surprising that one of their biggest clients is a company that offers a retail system. Websites with lots of functionality will get a lot of value out of Starcounter. The app concept Starcounter is focusing on lets you build single purpose apps that will increase your website´s functionality step by step. Interactions and data sharing between apps is a breeze and offers many build in features you won’t find in other systems. If you are relying on offline functionality you should move on. The current version of Starcounter does not have any offline capability other than telling the user that he lost connection. Developing your own offline functionality will cost you the Starcounter frontend integration and you need to use their REST API. If you like to build a PWA you can of course do it with Starcounter but you will quickly get to the point there you need some kind of offline capability. A PWA looks and feels like a native app and a user will be confused if it does not work as soon as he loses connection. So, you need at least rudimentary offline capabilities that Starcounter don’t offer. Starcounter currently only runs on Windows with Linux support around the corner. But it is not available for mobile devices. Maybe there will be a Starcounter Mobile version in the future. This post is focusing on the key factors for creating technology friendly business cards. I will describe the information that should be present on a business card, how to reference additional information, guidelines for readability as well as the future of technology friendly business cards. Selecting which data should be on a business card is not a simple task. The first impulse is to put as much information as possible on the card. Before you do that you should sort the data you like to add by relevance and secondly by how fast the data gets invalid because of changes. For instance, many think that it is a good idea to put the company address on the card. But most companies do not own a building and instead renting. This information can easily change and your prospect or future business partner will carry an old address around. If you leave out information you need to offer an easy way to retrieve this information. One solution to this problem is a link to your company homepage or an individual contact card page. My proposal is to create a profile on a professional identity service like LinkedIn and use your profile link on your business card. This has the advantage that the business card still holds some of its value after you changed the company since you can update your information online. If the business card links to your company page you will probably lose the connection as soon as you quit your job. Make sure your link is mobile friendly. Now that you defined a link you like to reference you need to think about the length of the link since people can’t click on it and need to type it in the browser. You can use a URL shortener service (like Google URL Shortener)that will offer you a small URL that redirects to your (long) URL - LinkedIn has a short public profil URL. There are a lot of different service providers, choose one that you trust to exist for a long time since your business card will depend on their link. If you present a link on your business card then think about offering a more convenient way to get the link from your card and into a browser. Generate a barcode out of your link and place it on your business card. Usually you use a matrix barcode like QR. A QR code has a fast readability and a greater storage capacity compared to barcodes you know from shopping. Additionally, you can still extract the data from a QR code that is up to 30% destroyed! 1. You can find plenty online QR code generators on Google. 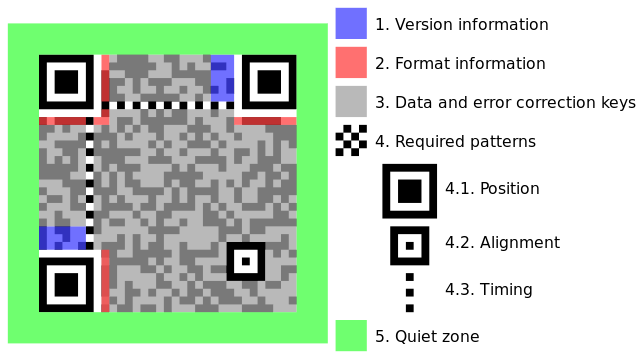 To increase the recognition of your QR code you should uses around 32×32mm of your business card (not less than 26x26mm) for the QR code and use a 4 modules wide quiet zone (empty space) around the QR code. Pay attention that you do not put the QR code - or other information - to close to the borders of your card since it could be removed in the production. You could also use the QR code to store your contact details on it but when you end up with the problem of outdated data. There are many apps for smartphones that aim to extract the contact details of business cards. For instance, the latest Moto camera app for Android will ask you if you like to create a new contact if it recognizes a business card. For this apps to work probably you should check your design against the most popular apps and tweak your design to offer a good recognition. This factors not only help a camera lens detect your details but also the human eye. Some companies start to offer business cards with near field communication (NFC). NFC [..] enables two electronic devices, one of which is usually a portable device such as a smartphone, to establish communication by bringing them within 4 cm (1.6 in) of each other 2. This can be considered as the future replacement for the QR code. Today I would not replace a QR code with NFC since not many users know how this works or expect it. Of course, if you work in the tech industry it is a nice gimmick to have on your business card and you can expect that more people will get how it works. I read about a GIF that will run 1000 years till it has ended one loop. I told a friend about it and he had the idea to create a white canvas and every day you add one pixel to it. At the end, you would have a complete image that has grown over time. I thought about the other way around - displaying an image that loses one pixel every day. This would also cover up pixel failures in the screen but I decided to give his idea a try. See the Pen Art Project - Every day a pixel by Jens Willmer (@jwillmer) on CodePen. See the Pen Art Project - Every day a pixel (Timelaps) by Jens Willmer (@jwillmer) on CodePen. Found this image on thewallpaper.co. If you are thinking of hosting a blog on GitHub and like to use a custom domain for it then this blog post is for you. I will show you which services I used and which settings have worked for me. The nameservers of your domain. In the following steps, I use the domain jwillmer.de. You need to replace this domain with your own to get it to work. Make sure that the A record IP’s are still the same by visiting the GitHub page. This tutorial was created after a request from Sampath Vanimisetti on Github. He helped me in the process to test this tutorial and improve it - thank you! Jekyll is an awesome static file generator and it is really easy to create a blog with the generator. My current blog is built with Jekyll and you can find the jekyllDecent theme on GitHub. It only takes minutes to create your own blog and run it on Windows. 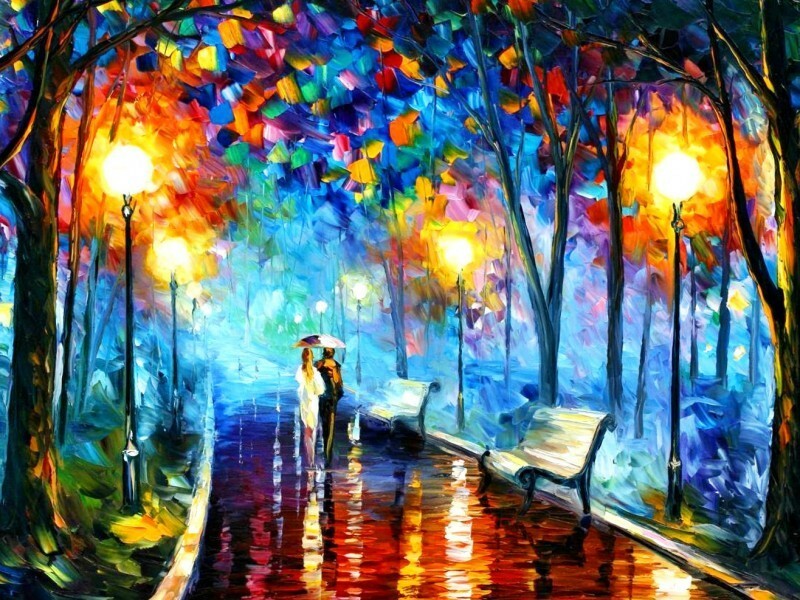 Now you can browse to http://127.0.0.1:4000 and visit your new blog. If you like to start changing your blog, I recommend you have a look at the Jekyll getting started guide. If you like what you saw you might know that you can host your blog on GitHub pages. GitHub will automatically generate your blog if you deploy the source code to the gh-pages branch of your repository. But the thing with GitHub is that you cannot run any plugin that is available for Jekyll. GitHub only allows a few plugins to run. GitHub has bundled the available plugins into a Ruby gem that can be installed via command line. The problem on Windows (x64) is that this is the point there it gets complicated. I assume that you have installed Chocolatey on your system. If you have a version of Ruby installed already you need to uninstall it. We need a specific version! The development kit did not set the environment path for Ruby so we need to do it. This gem is also needed in the github-gem. Continue with the next step and if you get errors about Nokogiri follow this steps. Note: In the current pre release it works out of the box with Windows x64 but this version is not referenced in the github-gem. 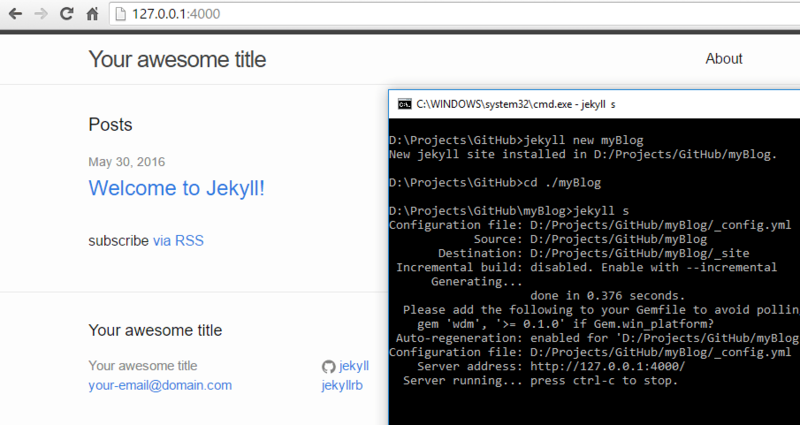 After this process you should have github-pages installed on your system and you can host your blog again with jekyll s.
There will be a warning on startup that you should include gem 'wdm', '>= 0.1.0' if Gem.win_platform? to your Gemfile but I could not get jekyll s working if I include that line so for the moment I ignore that warning. If you can wait 2-3 months, the installation process of the github-gem should be as simple as the setup of the blog. But as long as the new version of the Nokogiri (v1.6.8) is not stable and referenced it is work to get it up and running on Windows. As I’m leaving my current hosting provider, my WordPress backup needs to run on Azure. In this blog post I’d like to explain a few different ways to archive this. There are three possibilities I have encountered so far. Let’s start with the simplest. 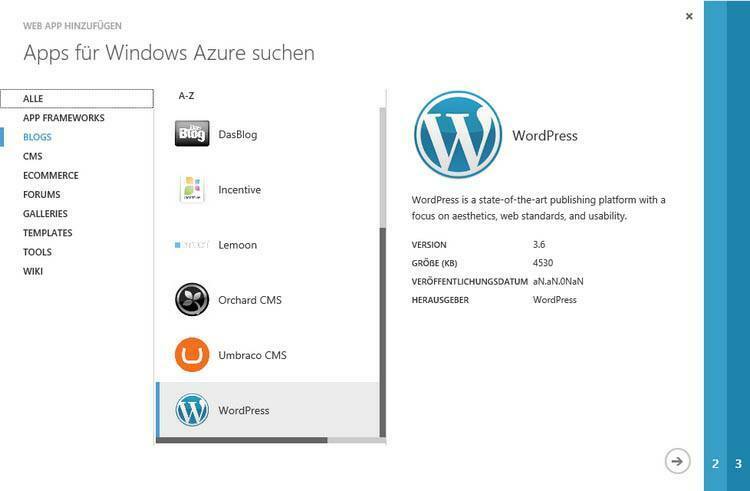 For the first migration of you WordPress blog to Azure you only need an Azure account. Create a new Website by choosing “Website from catalog” and select WordPress from the blog section. You need to enter a domain name for your blog and accept a third party service to host your MySQL database. Thereafter your blog will be created . 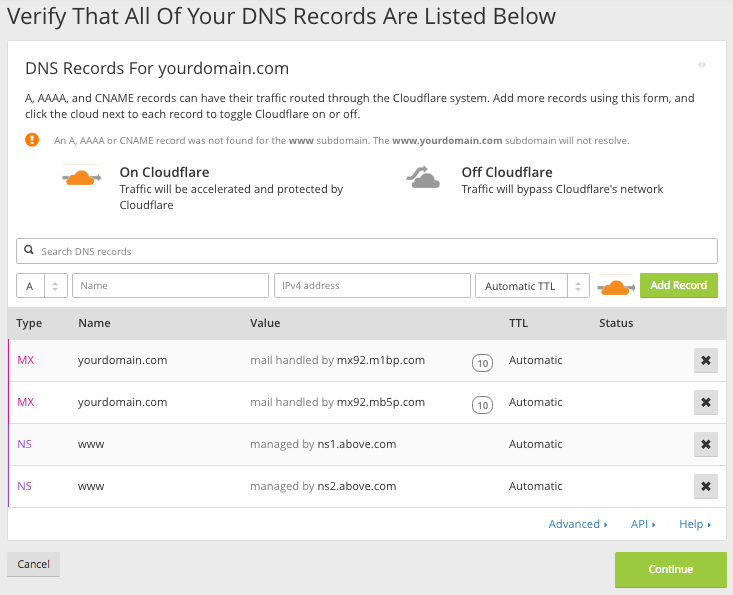 By browsing to your recently created domain you’ve be prompted to setup an admin account for your blog. 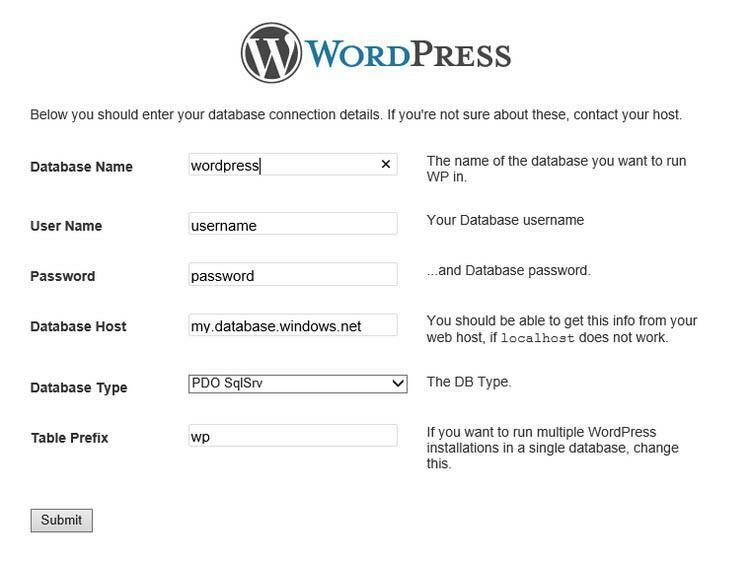 Next you create a backup of your old WordPress blog. Therefore you select the export option in the tools menu of your admin panel. As a result you’ll get a WordPress eXtended Rss file (WXR). This file you have to import into your new blog on Azure. The import function is located in the same menu like the export function – maybe you will be asked to install a plugin supporting the import. Now, your blog on Azure contains all your posts and the migration is finished. For using this method you need to know how to work with a FTP client. To start with, we create a new Azure website and upload the downloaded and extracted WordPress files into the wwwroot location of the website. As an alternative, you can use the website we have just created and remove the database by unlinking it from the website. This can be done by browsing to the settings of you website, in the sub-menu “Linked Ressources”. Thereafter you have to download the WordPress DB Abstraction plugin. Extract it and copy it to the ./wp-content/mu-plugins/wp-db-abstraction/ folder on your website. Also you have to extract the db.php file from this plugin and copy it into the ./wp-content/ folder. Finally, you need to remove the web.config file in your WordPress root directory – this file will be auto generated by the plugin. After having browsed to domain above, you’ll get a screen asking you for your database credentials. Insert your database without the port and choose PDO SqlSrv as database type. The rest is self-explaining. Afterwards your database connection is set and you can create a new admin account. To import you current WordPress data you need to follow the steps having been described above (simple solution). This alternative should be used by those who know what they do. To start with, setup you Azure WordPress blog having been described above – with one exception: instead of creating a new admin user and using the import function of WordPress you need to clone the existing MySQL database to the new MS SQL database. In order to fulfill this task you need the Microsoft SQL Server Migration Assistant. When you have downloaded and installed it you need to create a new project and select the migration to Azure option. Before filling out the connection settings to Azure you have to go to the Azure dashboard and add the current IP to the acceptance list of the database server. Afterwards you can setup the connections. Having established both connections you can go to the MySQL database which should be cloned and select “Convert Schema” from the context menu. This will locally(!) 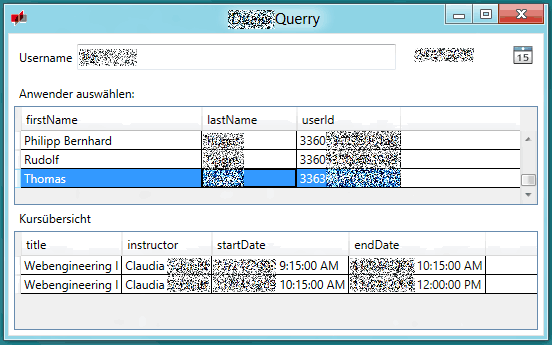 convert the existing schema to the MS SQL database. Check the result. If it was successful, select the Azure database and choose “Synchronize Database” from the context menu. This will process the local changes to the database. 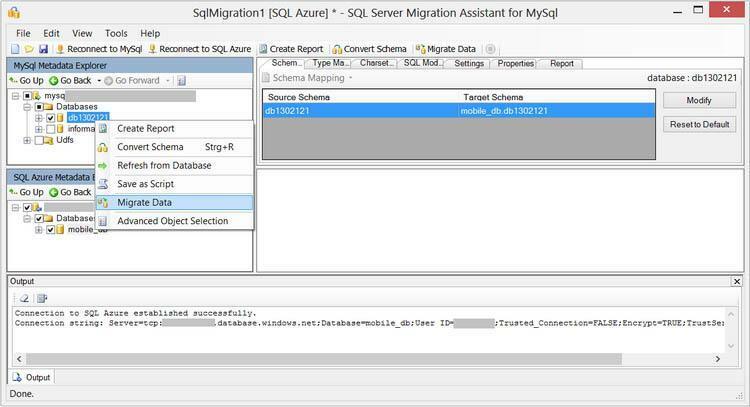 Than you choose “Migrate Data” from the MySQL database and synchronize the Azure database again. That’s it. If everything is all right you have an exact clone of you MySQL data in your Azure database, now. Check it by browsing to you Azure hosted WordPress blog. 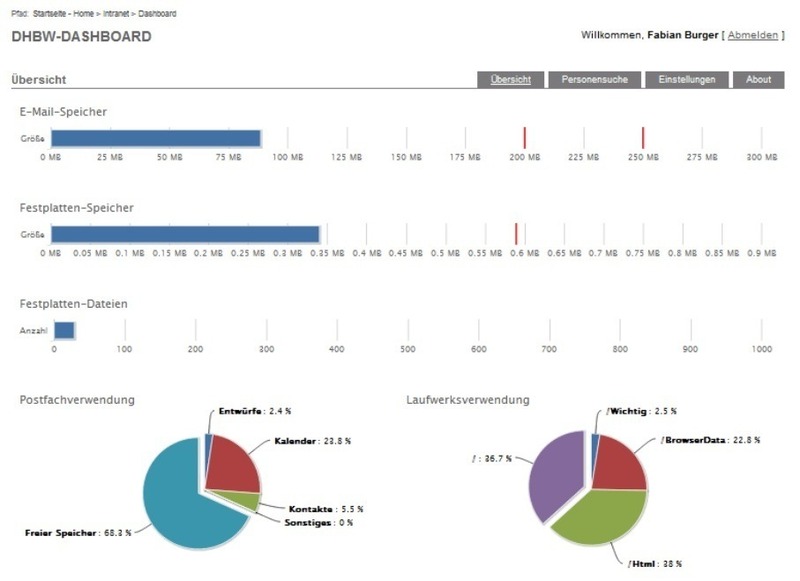 In meiner Studienarbeit ging es um die Entwicklung und Umsetzung einer zentralen Oberfläche (Dashboard) für das Intranet der Universität. Das Dashboard hatte dabei zur Aufgabe verschiedene Systeme der Universität anzubinden und die daraus zugänglichen Informationen dem jeweiligen Anwender anzuzeigen. Angebunden wurde ein Microsoft Exchange Server1, die anwenderspezifische Dateiablage auf dem Linux Server der Universität sowie das Active Directory. In diesem Teil der Arbeit wird der Schwerpunkt auf die praktische Umsetzung gelegt, wodurch der Grundlagenteil kleiner ausfällt als in der ersten Ausarbeitung. Die Grundlagen umfassen hierbei den Microsoft Exchange Server, das Linux Rechtesystem sowie die Verbindung zweier Peers über das Secure Shell Protokoll. Das Secure Shell Protokoll wird benötigt, um eine Verbindung zwischen der Anwendung und dem Linux Server herzustellen. Die Umsetzung des Projekts wird unter Verwendung von Visual Studio 2010 und ASP.NET MVC 3 angegangen. In dieser Ausarbeitung wird anhand von Quellcode beschrieben wie die Funktionalität der Anwendung umgesetzt wurde und welche Hürden dafür zu nehmen waren. Des Weiteren wird dem Leser im Unterkapitel Oberflächendesign das Aussehen der Oberfläche anhand von Momentaufnahmen vorgeführt und erklärt, was den Entwickler dazu bewogen hat es so und nicht anders umzusetzen. Diese Arbeit befasst sich mit der Erstellung einer Homepage, die dem angemeldeten Benutzer ermöglicht, sein E-Mail-Kontingent sowie sein verbleibendes Kontingent auf der privaten Dateiablage der Universität einzusehen. 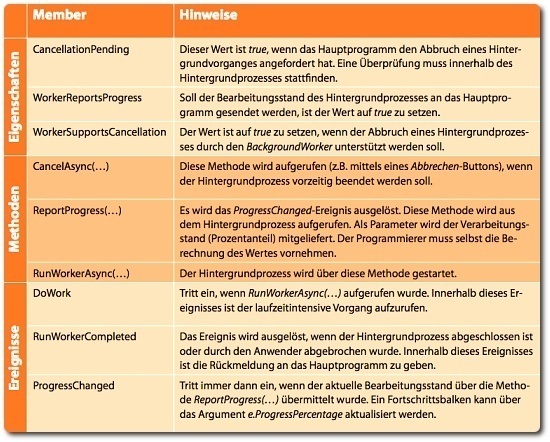 In diesem Teil der Arbeit wird der Schwerpunkt auf die Grundlagen gelegt und es wird damit begonnen, die Projektstruktur aufzubauen sowie die Anmeldung am Active Directory zu realisieren. Die Grundlagen umfassen hierbei den Microsoft Windows Server, den Microsoft SQL-Server, das .NET-Framework, die Entwicklungsumgebung Visual Studio 2010 sowie das Entwicklungsmuster Model-View-Controller. Die Umsetzung des Projekts wird unter Verwendung von Visual Studio 2010 und ASP.NET MVC 3 angegangen. Es wird hierzu beschrieben, an welchen Stellen die Anwendung und der IIS konfiguriert werden müssen, um eine verschlüsselte Verbindung zuzulassen und wo die Anmeldedaten für das ActiveDirectory abgelegt werden. Des Weiteren werden Daten aus dem ActiveDirectory in einer lokalen Datenbank zwischengespeichert, welche ebenfalls beschrieben wird. Für die folgende Studienarbeit habe ich den ursprünglichen Blogpost leider gelöscht. Ich konnte jedoch noch alle Metadaten (Datum, Postname, Dateien, ..) finden, sodass sich dieser Post nicht groß unterscheiden sollte. Die Aufgabe dieser Arbeit ist es, Möglichkeiten zu finden, mit welchen der Funktionsumfang von SharePoint Online erweitert werden kann sowie die Vor- und Nachteile von Cloudlösungen zu evaluieren. Hierzu werden zwei Anwendungsbeispiele vorgestellt und betrachtet wie diese sich, in SharePoint und SharePoint Online, lösen lassen. Im Verlauf der Arbeit wird deutlich, dass die einzige Möglichkeit, SharePoint Online zu erweitern, über das Erstellen von Sandboxed Solutions möglich ist. Werden Funktionen benötigt, die über den Rechtekontext des aktuellen Anwenders hinausgehen, wird zudem ein externer Server benötigt. Dieser führt – mit einem Administratorkonto ausgestattet – die Funktionen anstelle des aktuellen Anwenders auf dem Server aus. In meiner ersten Praxisarbeit für die Duale Hochschule beschäftigte ich mich mit der Installation und der Einrichtung eines Dokumentenmanagementsystems (DMS). Als DMS wählte ich SharePoint 2007. 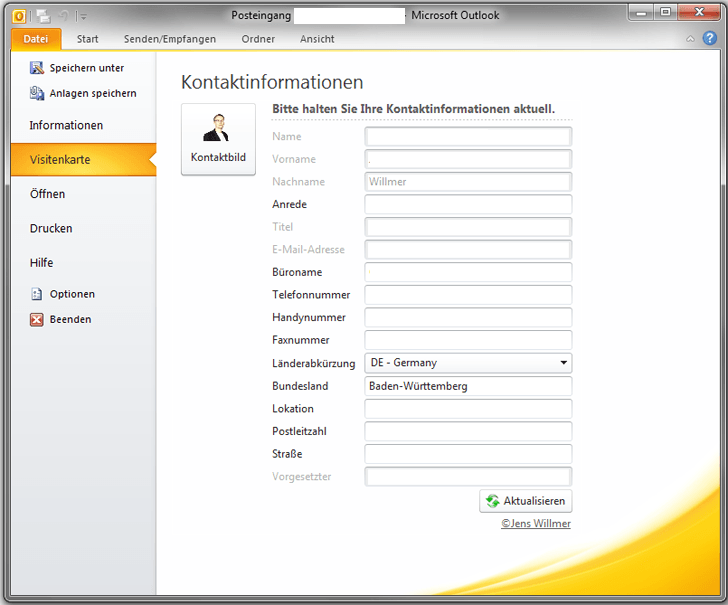 Ich beschäftigte mich dabei mit der Planung des späteren Funktionsumfangs, den Grundlagen von SharePoint 2007, dem Einrichten eines Windows Servers, der Konfiguration des Internet Information Services sowie des anpassen des DMS an das Corporate Design. Damit diese und weitere Arbeiten die ich in meinem Studium angefertigt habe nicht auf meiner Festplatte in Vergessenheit geraten möchte ich Sie durch das Veröffentlichen auf meinem Blog der Allgemeinheit zugänglich machen, auf dass sie für den ein oder andere noch nützlich sein können. Problemstellung: In der zu untersuchenden Firma gab es das Problem, dass die zu verwaltenden Datenmengen zu groß wurden, um sie mit der bisherigen Lösung weiterhin zu verwalten. Die Verteilung der Dokumente in die Ordnerstruktur und die Verlinkung in andere Ordner nahm ein zu großes Ausmaß an, sodass die Übersichtlichkeit verloren ging und der administrative Aufwand unrentabel wurde. Dazu kam, dass es keine praktikable Lösung für Sicherungen gab, sodass der Server für Sicherungen erst heruntergefahren werden musste, was ein Ausfall der Erreichbarkeit der Daten zufolge hatte. Ziel: Das Ziel war es die Datenmengen in ein neues System zu portieren, welches eine merkliche Erleichterung der Administration zufolge haben sollte. Weiter wurde gewünscht, dass es eine ausgeklügelte Suche gibt, mit welcher sich die Daten schnell und effizient wiederauffinden lassen. Zudem wurden eine dauerhafte Erreichbarkeit und die Option zur Datensicherung verlangt. On July 2012 I had the problem that I wanted to connect to a SharePoint Online instance that had an Active Directory Federation Services (ADFS) in front. At this time I couldn’t find any how-to on the web that would explain me how to do it. I asked at stackoverflow.com for a solution and became a hint and also found a post by Wictor Wilén at his blog that describes the authentication to SharePoint Online without an ADFS. At this time I solved my problem with a workaround in the project but later that year I had the same problem again and I know that I had to solve it on my own because my stackoverflow.com question hadn’t received any new answers. I used Fiddler, a web debugging proxy, to understand the authentication process. First you need to get the Security Assertion Markup Language (SAML) tokens. I looked up the needed requirements for the SAML-Tokens and was able to get them. With those tokens I was now able to get a token from the Microsoft Online Services (MOS) via the Secure Token Service (STS). With that token I can now finally authenticate my application against SharePoint Online and receive a authentication token that I have to use in all my REST-Requests (as cookies) in order to authenticate my requests. At this last point on receiving the token from the Secure Token Service (STS) I stumbled upon an article from Omar Venado that solved my problem and posted the solution in his blog. Because I was short on time I used his finished solution in my project (with a few fixes and modifications) and throw my pre finished solution away. This is why I didn’t post some code snippets - look at Omar’s post for the snippets and a deeper explanation. Den heutige Post wollte ich schon längst schreiben, hatte aber immer andere gute Gründe dies nicht zu tun. Dafür ist er jetzt sogar auf Deutsch. Der Grund dafür ist, dass ich das Plugin, welches ich euch jetzt vorstellen werde, als Workaround für meine Kollegen programmiert habe und deshalb die Menüführung auf Deutsch ist. Das Outlook Visitenkarten Add-In wurde entwickelt, um Anwendern die Möglichkeit zu bieten, komfortabel ihre, im Active Directory hinterlegten, Informationen zu pflegen und aktuell zu halten. Der Grund für die Entwicklung dieses Add-Ins lag darin, dass in unserem Unternehmen die Soft- und Hardware der Mittarbeiter ausgetauscht wurde. Das Unternehmen migrierte von Windows XP zu Windows 7 und Office 2010. Die in Office 2010 zur Verfügung stehenden Funktionen zur Kollaboration beziehen die Kontaktinformationen der Anwender aus dem Active Directory. Leider war dieses zum damaligen Zeitpunkt nicht ausreichend gepflegt, wodurch in den Office Produkten nur spärliche Informationen über den eigenen sowie die Firmenkontakte angezeigt wurden. Um diese Informationen schnell und ohne viel Bürokratie einzupflegen, wurde dieses Add-In entwickelt, welches den Anwendern die Möglichkeit bietet, ihre Kontaktinformationen selbst zu pflegen und aktuell zu halten. Die zu bearbeitenden Felder können im Active Directory durch den Administrator eingeschränkt werden. Dadurch behält die IT weiterhin die Kontrolle über die Einträge im Active Directory und kann Anwender- oder Gruppengebundene Rechte für die Bearbeitung der Felder anlegen. Durch die Installation der Anwendung als ClickOnce-Bereitstellung ist die Aktualisierung problemlos und es werden keine erhöhten Anwenderrechte für die Installation benötigt, wodurch der Einsatz für einen maximalen Anwenderkreis ermöglicht wird. Das Plugin funktioniert wirklich gut, einzig eine manuelle Anmeldung an das Active Directory fehlt. (Das Plugin verwendet immer das Systemkonto.) Dies ist aber für 99% der Anwender egal, weil diese das vorkonfigurierte Betriebssystem des Unternehmens benutzen - der Rest sind Entwickler(maschinen), welche sich mit dem AD-Explorer von Microsoft zu helfen wissen ;-). Für alle die es testen möchten, selbst gebrauchen können oder sogar Lust haben es auszubauen, habe ich es auf GitHub geladen. In my example I use the Model-view-controller (MVC) architecture with a little help from the MVVM-Light Toolkit. 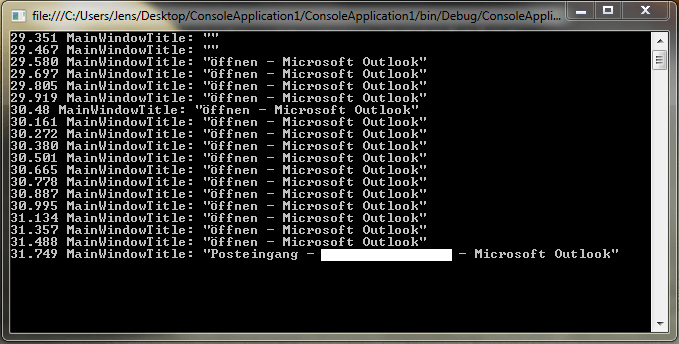 How to start Outlook minimized with C#? Im Rahmen dieser Studienarbeit werden zunächst die verschiedenen Plattformen mobiler Endgeräte vorgestellt. Ausführlich wird auf die Möglichkeiten der Software entwicklung für diese Betriebssysteme eingegangen: Vor- und Nachteile von Native Apps und Web Apps, das Konzept der Hybrid Apps, die Plattformunabhängigkeit mit den nativen Features der Plattformen zu kombinieren, sowie der Ansatz von Generated Apps. Anschließend wird das Framework PhoneGap praktisch an einigen Anwendungsbeispielen getestet. Da es durch seine Performance nicht restlos überzeugt, werden ähnliche Programmierbeispiele anschließend mit dem Titanium SDK durchgeführt, einem weiteren Framework zur hybriden App-Entwicklung. Da sich damit allerdings nicht alle benötigten Funktionalitäten abdecken lassen, wird für die Umsetzung des Praxisprojekts PhoneGap eingesetzt. Im zweiten Teil der Arbeit wird das Projekt StudiCast, ein Konzept zum mobilen Lernen, vorgestellt und praktisch umgesetzt. Dabei geht es darum, kurz zusammengefasste Lerninhalte aus Schule und Studium selbst mit einer App aufzunehmen, um sojederzeit und überall durch wiederholtes Anhören lernen zu können. Diese Podcasts können außerdem über eine Community mit anderen geteilt werden. Zusammenfassung - Diese Arbeit erläutert die Idee und den Nutzen von JSON. Einleitung - Der Begriff Web 2.0 prägt seit einigen Jahren den Sprachjargon rund um das World Wide Web. Entstanden ist er irgendwann um 2003. Das Web 2.0 steht für eine neue Ära im Umgang mit dem Internet. Der Gebrauch der Versionsnummer soll eine Abgrenzung zum bisherigen WWW, sozusagen der Version 1.0 darstellen. Bestanden Websites bis dahin meist aus statischen HTML-Seiten, die von einem festen Autoren-Kreis bearbeitet wurden, rückte nun die dynamische Bearbeitung von Inhalten immer mehr in den Vordergrund. Benutzer einer Website konnten und sollten selbst Inhalte einstellen. Überall entstanden Gästebücher, Foren, Weblogs und Wikis. Das Content-Management wurde zu einem zentralen Begriff: Bearbeiter einer Website brauchten keine umfassenden Programmierkenntnisse mehr, sondern konnten mit webbasierten Oberflächen ihre Seiten bearbeiten und die Änderungen sofort sehen bzw. online stellen. Für die Vorlesung “Verteilte Systeme” musste jeder aus unserem Studiengang eine kleine Ausarbeitung erstellen. Damit diese Arbeiten nicht nur unseren Noten helfen, poste ich diese, im Namen der Autoren, auf meinem Blog. 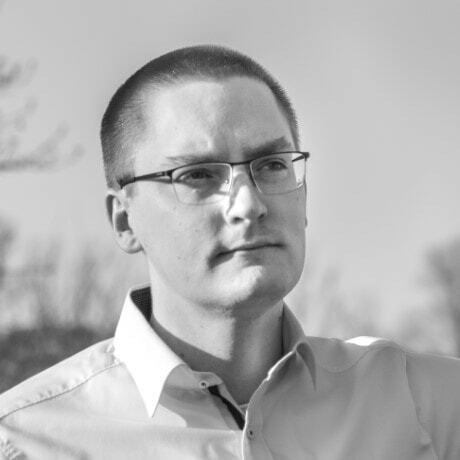 Angefangen mit der Ausarbeitung von Oliver Burger zum Thema “Pyro - Python Remote Objects”. In der hier vorliegenden Arbeit werden die Grundzüge der Programmierung mit der Pyro-Bibliothek zum Erstellen verteilter Anwendungen unter Python dargestellt. Hierbei soll das grundlegende Vorgehen der Programmierung dargestellt werden sowie die Architektur dieser Anwendungen betrachtet werden. Yesterday I was playing around with Windows 8 and VisualStudio 11 and because my University is developing a web service to connect to the class schedule I played around with the semi-finished service and tried to get some data out. The implementation of the alpha service is horrible, there is no authorisation and there isn´t planed some, everyone can get the usernames of the students and their class schedules. Also there is no limitation of the output, I had to limit the output myself to avoid a crashing program while my integer was too small. Finally you can´t get a person by his unique mail address, you have to search for the last name and let the user select the right person because the mail is not provided and finally the search results are redundant. So in short terms, the service is buggy but that´s not the problem, that´s a challenge ;-) Anyway my intension was to play around with the .NET-Framework 4.5 and the service was just an opportunity. I used async and await the first time and I really liked it :-) It is very easy to use, with async in the header you can define your method as asynchronous and with the use of await you can select a specific function inside the asynchronous method that it needs to wait for. No need for callbacks anymore ;-) A very good article about async, await and the pros and contras can be found at msdn (german). Below you can see my WPF solution. I can´t post the whole project because the service shouldn´t be available for everyone right now and it isn´t - there are some more hints needed to get it to work properly..
Below I post you the code and at the end of the post you will find a ZIP-file with the project - have fun. The problem was that I need to access different Exchange accounts via Exchange Web Services (EWS) and read out the mailbox size. You can find an explanation to this code on MSDN. /// Gets the size of the mailbox in kilobytes. Diese Seminararbeit hat das Ziel, einen Überblick über die Disziplin des Software-Reengineering zu verschaﬀen. Um das zu erreichen, werden zum einen die einzelnen Ausprägungen erläutert, zum anderen eine Abgrenzung gegenüber Techniken beschrieben, die zwar ähnliche Ziele verfolgen jedoch auf einem höheren bzw. niedrigerem Abstraktionsniveau ansetzen. Außerdem soll der Begriﬀ des Software-Reengineerings erläutert werden und auf seine Unterschiedlichen Bedeutungen hin untersucht werden. Im Rahmen dieser Arbeit werden ebenfalls Werkzeuge vorgestellt, mit denen sich das Reengineering automatisieren oder vereinfachen lässt. Viele dieser Werkzeuge sind dabei Ergebnisse aus der Forschung und somit im Rahmen von Projekten an Universitäten oder forschenden Unternehmen aus der Wirtschaft entstanden. Es wurde aber auch untersucht, ob es Werkzeuge aus dem Open-Source-Bereich gibt. Zusätzlich sollen Best-Practices beschrieben werden, mit denen bereits Reengineering-Projekte erfolgreich durchgeführt wurden. Eine wirtschaftliche Betrachtung wurde nicht durchgeführt, jedoch wurden einige Aspekte davon behandelt. Because of some changes in my company I now have to code for iOS. This is why I need to learn Cocoa (the programming language for developing iOS software). So tonight I have set up a virtual machine with Mac OS X Lion 10.7.2 to play a little bit around with Xcode - the preferred IDE. For this how to I assume that you have already played around with VMware and also know how to open a terminal window in Mac OS X. Execute the VMware unlocker (Mac OS X Lion VMware Files.exe), it extracts the unlocker and a predefined VM. The windows.bat stops the VMware service, installs a patch and then starts the service again. At this point you have to trust the patch that he does what you’re expecting and isn´t a virus..
Now go to the Mac OS X Lion folder and double-click the Mac OS X Lion.vmx that should start the VMware - likewise you can start the VMware first and browse for the file. Edit the VM settings and add another (existing) hard drive, the Mac OS X Lion Installer.vmdk that you have downloaded earlier - around 4,12GB, you remember? If VMware asks you to repair the hard drive, let VMware do it. 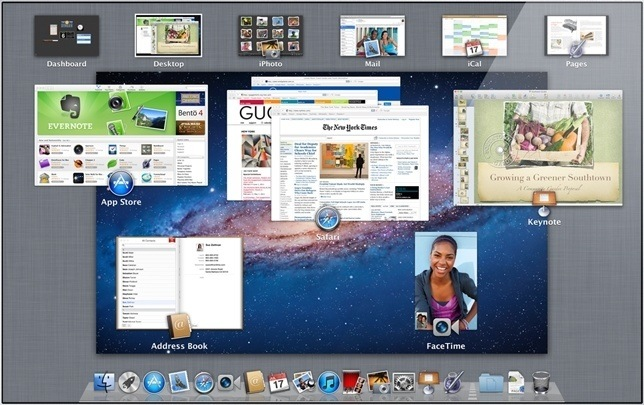 Now follow the Mac OS X instructions for installing the OS. Now shutdown the VM, make a snapshot, add a soundcard (in the settings) and power it on again, we will now update the VM to 10.7.2! After booting you have to open a terminal window in the Mac VM. We now backup a file - the dot at the end isn´t accidentally! Copy the Mac Os X update to 10.7.2 to your share drive and install it within the VM. Don´t reboot! Shutdown your VM. Remove the second hard drive and the mounted CD-iso, you do not need them any more. Now you hopefully have a working Mac OS X Lion 10.7.2 VM in the Mac OS X Lion directory, feel free to move your VM to another location of your hard drive and remove/backup the installation files. To update your system to 10.7.3 you have to download the update-image from apple.com and then go back to step 5. Dieses kleine Script listet die Verzeichnisstrukturen auf und verlinkt deren Inhalte. Eine weitere Ausarbeitung aus der Datensicherheit-Vorlesung, diesmal zum Thema Sicherheitsmechanismen im Netzwerk, geschrieben von Yassin Uddin und Jonas Bartusch. Abstract — Die steigende Internet-Euphorie der letzten Jahre lässt oft vergessen, dass jeder Rechner, der an ein offenes Netzwerk wie das Internet angebunden ist, per se einen Angriffspunkt für Hacker und Cracker darstellt. Dieser Artikel entstand als Seminararbeit der Dualen-Hochschule Stuttgart Campus Horb des Studiengangs AI2009 und soll Heimanwendern und Administratoren aufzeigen, welchen Risiken Rechner und Daten im Netz ausgesetzt sind und wie man diese vor potentiellen Angriffen schützt. Dieser Artikel ist in zwei Abschnitte unterteilt. Der erste Abschnitt befasst sich mit Angriffsmöglichkeiten und den Zielen die dahinter stecken. Desweiteren wird im zweiten Teil erläutert welche Sicherheitsmechanismen das System schützen und auf die Vor- und Nachteile eingegangen. Es freut mich euch heute eine weitere Ausarbeitung aus der Datensicherheit-Vorlesung veröffentlichen zu dürfen. Diese stammt von Oliver Burger und Andre Ufer. Auch diese Ausarbeitung stammt aus der Vorlesung “Objektorientierte Software Engineering”, geschrieben von Tobias Maier. Zusammenfassung - Usability Engineering bezeichnet ein Gebiet, in dem es darum geht eine optimale Mensch-Maschinen-Schnittstelle zu entwickeln. Bei einer solchen Schnittstelle liegt das Hauptaugenmerk auf der Benutzerfreundlichkeit. Die entwickelte Schnittstelle soll möglichst effizient für die vorgesehenen Arbeitsaufgaben gestaltet sein und zudem ein ansprechendes, gewohntes Aussehen haben, damit der Benutzer gerne damit arbeitet und sich schnell zu Recht findet. Des Weiteren muss die Schnittstelle vorgegebene Standards und Guidelines einhalten. Einleitung - Usability Engineering beinhaltet eine Vielzahl von Aufgaben, welche sich über den kompletten Zeitraum eines Projektes hinziehen. Die Bedienbarkeit kann nicht als eine isolierte Aufgabe während des Projekts betrachtet werden, vielmehr ist die Bedienbarkeit ein wichtiger Teil der Entwicklung. Diese verläuft parallel zu der Programmierung des Produkts und hat direkte Auswirkungen auf die Reputation einer Firma, denn die Bedienbarkeit des zu verkaufenden Produkts wirkt sich auf die Produktivität und Zufriedenheit der Anwender aus. Um die Entwicklung der Oberfläche und die damit verbundene Bedienbarkeit so effizient wie möglich zu gestalten wird das Usability Engineering in verschiedene Prozessphasen eingeteilt, welche in den kommenden Abschnitten näher betrachtet werden. In den letzten Wochen hatten wir in der Datensicherheit-Vorlesung die Aufgabe zu verschiedenen Themen aus dem Bereich eine Ausarbeitung zu erstellen und diese vorzutragen. Damit die Arbeit jetzt nicht in der letzten Ecke meiner Festplatte verstaubt, poste ich euch hier meine Resultate. Diese Arbeit befasst sich mit Methoden der sicheren Software-Entwicklung (am Beispiel des Microsoft Security Development Lifecycles) sowie bekannten Schwachstellen in Software wie Buffer Overflows oder String Format Attacken. Am Beispiel einer selbstgeschriebenen C++ Anwendung wird hierbei eine Buffer Overflow Schwachstelle verdeutlicht und anhand eines weiteren Programms, das ausnutzen dieser Schwachstelle beschrieben. Anbei der Code womit sich neue WPF-Fenster in einem eigenen Thread öffnen lassen. War eine unsere Aufgaben in der Vorlesung Betriebssysteme. 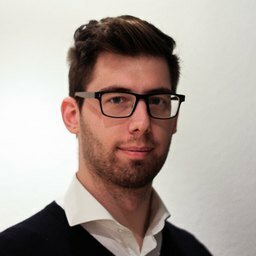 Pils wird in einem neuen Thread ausgeführt und nach Fertigstellung wird bw_RunWorkerCompleted aufgerufen und im alten Thread ausgeführt. set /p menue="Bitte Aktionsnummer eingeben: "
set /p proxy="Bitte Proxyname eingeben: "
set /p port="Bitte Port eingeben: "
echo Port ist zu lang, bitte kleineren Port eingeben. 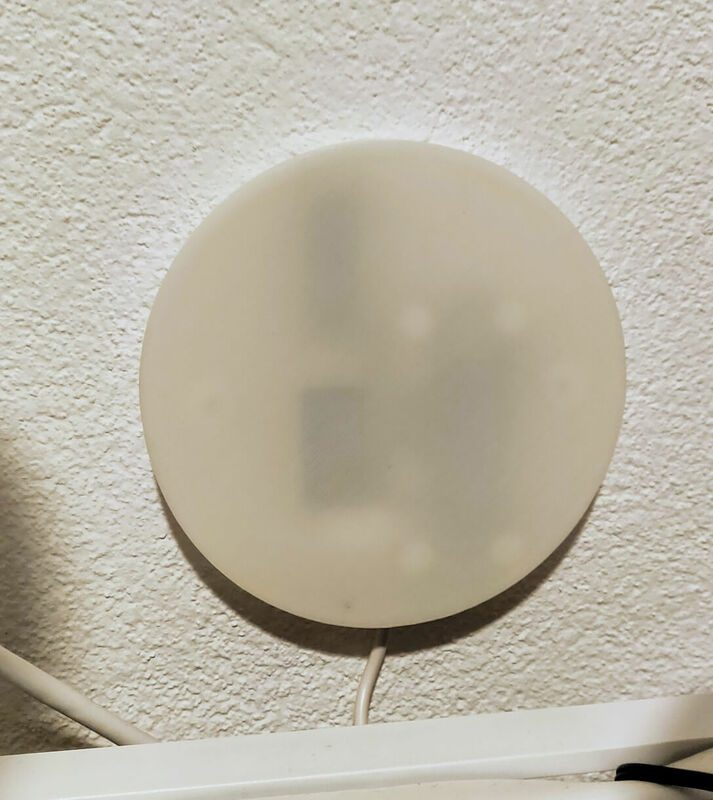 Windows 7 besitzt von Haus aus einen virtuellen Wifi-Netzwerkadapter mit welchem es möglich ist seinen Rechner in einen Access Point zu verwandeln. Damit das komfortabel von statten gehen kann habe ich euch ein kleines Kommandozeilen-Programm geschrieben. set /p pw="Bitte WLAN-Passwort eingeben: "
echo Das WLAN wird nicht durch ein Passwort geschuetzt! set /p exceptPW="Bitte Aktionsnummer eingeben: "
set /p ssid="Bitte SSID eingeben: "
echo Der WLAN Access Point mit der SSID: %ssid% wurde eingerichtet. echo fuer unseren Netzwerkadapter freigegeben werden! //Alle Wortlisten in eine Liste packen. In diesem Post möchte ich erklären wie man einen Server mit der Linux-Distribution Slitaz manuell aufsetzt. slitaz-3.0-base.iso [8.0M] - Base system in text mode and including useful commandline tools. Zuerst brennen wir die Live-CD. Danach booten wir mit Hilfe von ihr und loggen uns mit Username: root und Passwort: root ein. starten wir fdisk mit meine zu Partitionierenden Festplatte. Als nächstes legen wir eine primäre Partition im ext3-Format an (Defaultformat bei dem erstellen einer Partition via fdisk - ID 83), und machen sie durch ein Boot-Flag bootbar. Erstellen das Bootverzeichniss auf unserer neuen Festplatte, kopieren die Systemdaten auf die Festplatte, wechseln mit unserem aktuelle Verzeichnis auf die Festplatte und extrahieren die Systemdaten, löschen nicht mehr benötigtes Archiv (mit der Tabulatortaste lassen sich Befehle, Verzeichnisse,Pfade vervollständigen). Danach starten wir Grub und legen die Festplatte fest auf der Grub Installiert werden soll, in meinem Fall ist das die erste Festplatte und davon die erste Partition. Danach überprüfen wir mit find ob Grub alle benötigten Daten findet, um zum Schluss Grub den Befehl zur Installation zu geben. Bat-Datei welche LanDesk beendet wenn sich der Rechner im Firmennetz befindet. Einfach in den Autostart verschieben. Der Platzhalter: “InternErreichbarerFIRMENSERVER” muss in diesem Script noch angepasst werden. echo Sie befinden sich nicht im Firmennetz! echo LANDesk wurde NICHT beendet. echo Sie befinden sich im Firmennetz. Mit diesem kleinen Tool lässt sich das aktuelle Active Directory auflisten und zwischen Usern und Gruppen hin und her springen.